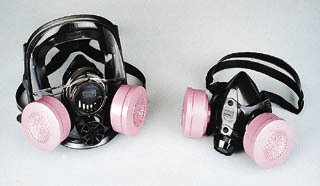 Comfortable half-mask or full facepiece respirators for use with North Safety cartridges and filters. Soft, hypoallergenic silicone makes these respirators close fitting and comfortable. Interchangeable cartridges and filters provide air purifying protection for a variety of applications. Direct cartridge-to-facepiece connection eliminates gaskets and cartridge receptacles. Half-Mask Respirator fits snugly while the cradle suspension system alleviates pressure points. Can be worn with safety glasses and goggles. Full Facepiece Respirator provides eye, face, and respiratory protection. Facepiece is made of soft, flexible silicone for optimum comfort. Impact resistant, wraparound polycarbonate lens permits +200° vision field. Includes oral/nasal cup and speaking diaphragm. NIOSH approved for impact and penetration resistance when used with North Safety cartridges and/or filters. Full facepiece lens meets ANSI Z87.1-1989 standard. The eyeglass frame holder for the 7600 series respirators is constructed of sturdy metal and attaches to the lens of the facepiece with a suction cup.